Industrial Strappers are utilized to place bands around boxes or containers to ensure they stay closed or contained. Some customers use strappers to band product to a pallet along with stretch wrapping or in lieu of stretch wrapping. Industrial strappers come in three basic versions: hand operated, semi-automatic (typically without an arch), and automatic (typically with an arch). 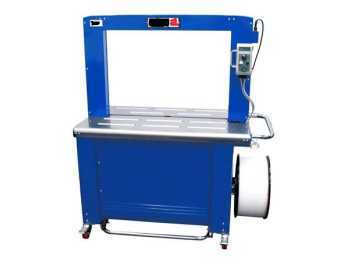 Different industrial strapping machines will use plastic, polyester, and / or metal banding material. Some automatic strappers can place up to 65 straps per minute. CSI provides industrial strappers for customers who need to securely close / contain boxes or containers or product to a pallet. We also offer Horizontal Carousels, Vertical Carousels, Vertical Lift Modules, Stretch Wrappers, Mezzanines, and Shelving.